This magazine freebie is back! 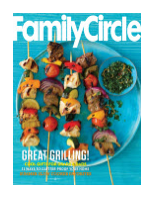 Go here to score 2 complimentary issues of Family Circle magazine courtesy of ValueMags.com. You’ll receive the October 1st and October 17th issues. There are NO strings attached and you will NEVER receive a bill! YAY for free beach-reading magazines!! Wa-Hoo! Don't Forget: Enter to win my cookbook giveaway going on right now until July 29! !